10th Biennial Childhood Obesity Conference - Attendee Registration Now Open! Join to continue to share and discuss emerging research, best practices, community-based efforts and effective policy strategies that promote and sustain healthy eating and physical activity practices for children, adolescents and their families! CA4Health has been exploring how our program office and members can collectively embody our commitment to health equity. Following PolicyLink’s Equity Summit in April, members of our CA4Health delegation collaborated to craft a set of intentions related to equity that will keep the energy and lessons alive for our network. 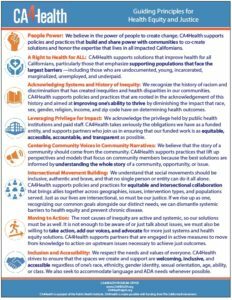 Our first outcome from these discussions is CA4Health's Guiding Principles for Health Equity and Justice. These principles express our commitment to equity and will inform how we assess what policies and/or actions CA4Health will support. In California, there are an estimated 10.3 million immigrants, constituting 27% of the state’s population. 2.9 million are undocumented Californians, nearly a third of the state’s immigrants. California’s immigrants also have diverse and intersectional identities. There are an estimated 250,000 undocumented LGBTQ+ immigrants in California. Among black immigrants in California, 16% are undocumented. Many immigrants have also gone through traumatic and often violent migratory experiences. 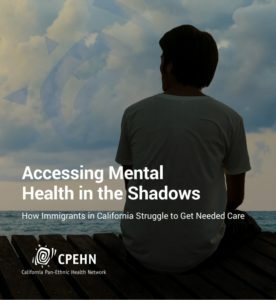 Coupled with the stigma of and misconceptions about receiving mental health services, these factors put the physical and mental wellbeing of immigrants at particular risk. California’s good food movement continues to make progress creating policy that will support a healthy, just and resilient agriculture and food system. The seventy organizations linked through the California Food and Farming Network and California Food Policy Council tracked twenty-one bills in 2018. Positions were taken on seventeen of them. Through the legislative or budget process, 70% of these bills were either killed or adopted in accord with our position. If you have any questions, comments or ideas on CA4Health policy work and activities, we’d love to hear from you.